Buzzsumo, the powerful tool that assess the popularity of online content, has listed Mr. Strive Masiyiwa, CEO of Econet Wireless and AGRA Board Chair as the world’s leader in Facebook engagement for 2018. 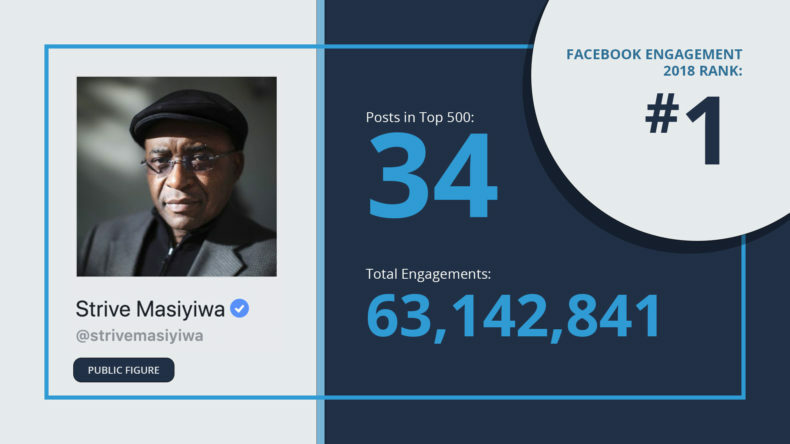 The tool looked at 777 Million Facebook posts to find the most engaging pages, brands, and videos for 2018 with Mr. Masiyiwa emerging top with 34 posts in the top 500. The total engagements across all his posts were a whopping 63,142,841 which is a major feat considering that the top 500 posts analysed by Buzzsumo represent nearly 1 Billion total engagements. Engagement, in Facebook terms, are the interactions on your posts on Facebook including likes and the rest of reactions, shares, comments – both positive or negative, and even the clicks made by users. In other words, an interaction would be any action that the user performs in relation to your brand or content. “Other than being the most engaging posts on Facebook, Mr. Masiyiwa’s content which was mainly mini-blogs was an exception to the 2018 trend where videos were generally more engaging” Stated Buzzsumo. His posts seem to focus on Masiyiwa’s vision for Africa reflecting one of the five reasons people share content on Facebook according to a New York Times study cited by Buzzsumo: Sharing content to raise awareness about an issue. Mr. Masiyiwa has been holding a series of town halls with African youth that are live streamed on his Facebook page. He has used these town halls that have become very popular to inspire young African leaders to get involved in driving inclusive economic growth on the continent as well as to explore opportunities for the young leaders’ engagement in the development of the continent.